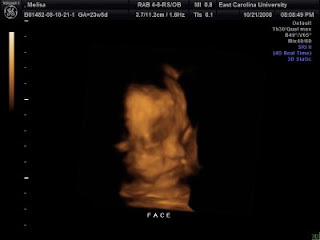 So this week we were lucky enough to get a free 3D ultrasound and while the regular ultrasounds have been good to us, the 3D and 4D was in one word amazing. To see details of our little one's face left us speechless. And we can't stop looking at the pictures. Here are a few of my favorites, enjoy. To get in on the Phriday Photo Fun, head on over to Candid Carrie's and find out what this phun is about! IT is amazing! I loved my three d sonogram! WOW! 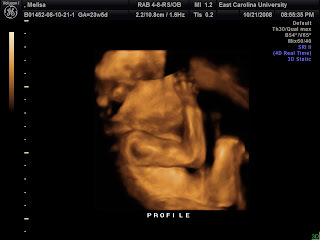 I never knew you could see so much detail in these 3D sonograms! Is he sucking his thumb in this last one - how cute!!!! Those are AMAZING pictures!!! AMAZING!! That is absolutely amazing! How very cool to get to see your baby so clearly, so early! He is beautiful! Nice halloween photos! (am a doula and really hate these...they make the baby look like aliens. sorry :-( I know your baby is so much more adorable than this...just wait until that precious moment! Those are absolutely wonderful. They were just starting with that technology when I had my last--almost 10 yrs ago. Stopping in from Candid Carrie--TFS! That is so cool. I didn't get to do this with mine. THOSE are amazing! We only did the 3D with our third child but I loved them! It is so cool to be able to see as much detail as you do in those! even though I saw ultrasounds of my two girls- I was never really sure they were human until they came out. no doubt about your baby here! Come back and try a caption! Maybe you'll win!!!! Wow...isn't technology amazing? BTW, don't forget that we're starting a Great New Pop'rs Halloween Giveaway at my place today...22 different, fun prizes. Come play, today! I'm sure daddy is proud ya'll are going to have a son =) So he will have a little buddy. That is simply amazing...and how precious is he...love it! that is so cool, and LT, relax, you are going to be an awesome mum! You gave me a few goosebumps...the good kind! So amazing! Aww, he's so cute! 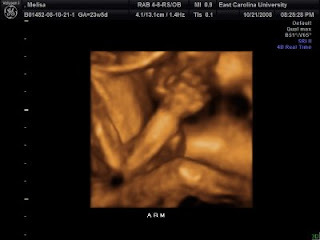 I wish that I'd gotten a 4D ultrasound with my little girl. He's sooo cute! Cant wait to meet him..